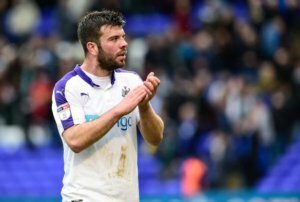 When Grant Hanley agreed to come to Newcastle last summer, once we finally agreed a fee for him with Blackburn Rovers, he would have hoped to have played more than the 13 games he has played for the Magpies this season. Grant has been a little unlucky that both Ciaran Clark and captain Jamaal Lascelles have both had very good seasons and Grant is now third choice center-back, but ahead of Chancel Mbemba, who was a starter last season in the Premier League. We heard from Massadio Haidara day or two ago that some players were frustrated with their lack of playing time at the club and that’s true with Grant too. Those are good words from Grant and it’s been great this season that our team spirit is so much improved over last season – when it was in a word – awful. Rafa Benitez and his coaching staff have to take a lot of the credit for that. If Clark is injured do you put in Grant or Chancel? Now that a true million dollar question, I don’t know what happened with Chancel, he used to be solid. I think Rafa has seen this coming. M’Bemba was an unused sub for the last 2 away games. Jib – I think it’s simply a case of with Clark Iinjured Mbemba is 4th choice CB so naturally he would be on the bench!